Kurzweil tend to combine existing technologies with new developments to create new products. So, if you take the VAST synthesis engine that underpins all of their keyboards and then add your selection from the extended piano library, the KORE 64 and orchestral expansion libraries, GM compatibility, KDFX effects, the KVA synth engine, the KB3 organ emulator, K2000–series object compatibility and sample playback, the chances are that you’ll specify one of the company’s instruments. The subject of today’s review is the latest of these although, instead of displaying the obvious differences between, say, the PC3K8 and Artis 8 that I reviewed for Sound On Sound in the August 2013 and May 2014 issues respectively, it appears to occupy the same ground as the Artis, perhaps as an extension of, or ultimately a replacement for, the earlier model. There are several visible improvements over the Artis, which is just as well because it’s a considerably more expensive instrument. Most obviously, it has a widescreen colour display. With a resolution of 480 x 272 pixels, this isn’t in the same class as many other manufacturers’ flagships, but it’s an important upgrade nonetheless. Similarly, the addition of LED ladders to the nine control sliders isn’t ground–breaking, but it’s welcome. There are also improvements visible on the rear panel, with more audio outputs and more pedal inputs and, on the inside, there are some new sounds and an increase in the number of factory Programs. True, the number of factory Multis has diminished but, since I never find a use for someone else’s idea of what constitutes a useful Multi, that doesn’t bother me. Much more significant is the increase in the maximum number of zones in a Multi from four to 16 and an increase in the maximum number of simultaneous effects units from 16 to 32. In addition, the number of user objects (which is Kurzweil’s terminology for anything that you can edit, save, recall or delete) has quadrupled from 512 to 2048. If it’s an upgrade, it’s a significant one. 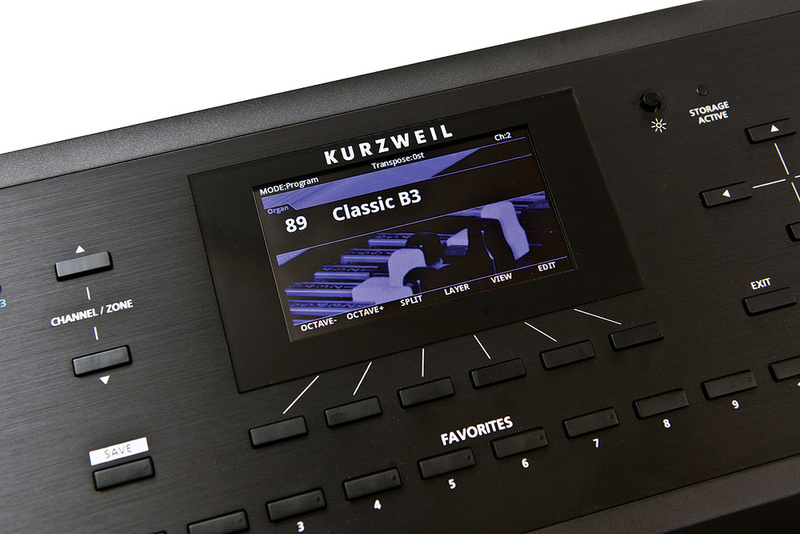 Kurzweil’s marketing promotes the Forte as a stage piano, emphasising the long, unlooped notes and key-release and pedal-noise samples stored within its huge new Flash Play memory (see box), so I started my review there. I had high hopes, but not all was as I had hoped. It wasn’t that the samples were poor (they’re not), nor that the overall sound quality was poor (it’s not) but, on one or two upper keys, the transition between the mf and f layers seemed horribly abrupt. I performed a factory reset in the hope that this might eliminate the dabbling of a previous user, but it didn’t, so I programmed a MIDI sequence to play each note in turn across the whole range of MIDI velocities. This confirmed what I had heard in normal playing. Don’t take my word for it. Select Program 2: Rich 7ft Grand, locate Db5, and slowly increase your playing velocity. The transition from MIDI velocity 76 to 77 is, well, horribly abrupt. I wondered whether I could have missed this on other Kurzweils, so I checked an earlier model and found that, while its underlying acoustic piano sounds weren’t as good, their velocity transitions were much more benign. So I wrote to Kurzweil. Impressively, the company’s reply was lacking in bluster and denials. “Thank you very much for your detailed comments about the Forte piano sounds, we really appreciate them,” they wrote. “The Soundware department is looking at all your comments. We will continue to refine those velocity transitions in the near future thanks to information like you have sent us. It’s really helpful.” So, while I think there’s still work to be done on the new piano library and its related Programs, I’m confident that things will improve in due course. I was much happier with the Forte’s excellent EP200 and Rhodes emulations, together with its FM pianos, RMI Electrapianos, CP80s, Clavinets and Harpsichords, many of which are new on this model. The Forte’s 480 x 272 pixel colour screen is larger than its predecessor’s.The next group of sounds centres upon Kurzweil’s KB3 emulation of the Hammond organ and Leslie speaker. KB3 has been around for a long time, undergoing incremental improvements over the years, and it’s now a fine–sounding system. The implementation is good too, with the faders on the control panel acting as drawbars, and the keyclick, percussion and rotary speaker controls assigned to the Forte’s buttons. By default, the rotary effect speed is also controlled by the sustain pedal, which is a pain if you want to sustain one or more elements of a composite sound that includes a Hammond emulation but, thankfully, you can defeat this. As a bonus, the Hammond sounds generated by KB3 don’t steal polyphony when used together with other sounds. This is excellent if, like me, you spend a lot of time layering Hammonds with string ensembles, pads and choruses. However, it always feels odd to play Hammond licks on a hammer–action keyboard so, if KB3 is among your primary reasons for considering the Forte, you should perhaps look further down Kurzweil’s range or consider hooking it up to a suitable MIDI controller to use as a dual–manual system. KB3 also generates a range of Vox and Farfisa sounds that do steal polyphony. These are less accurate than the Hammond emulations (the Farfisa emulations even use drawbars rather than switches for their footages!) and the same caveat regarding the keybed applies, but you’ll find them very usable nonetheless. Stepping through the rest of the factory Programs — strings, brass, synths, basses and so on — I discovered many that I recognised from earlier instruments. Part of me wishes that these had been updated, but there’s a strong case here for arguing that ‘if it ain’t broke, don’t fix it’, and owners of previous models will be reassured that they’re not necessarily going to lose favourite sounds if they adopt the new model. While you’re encouraged to view the Forte as a preset ‘stage’ instrument, you’d be doing it a disservice if you didn’t experiment with its onboard editing. In principle, there’s little that’s daunting here, because the monstrous power of its VAST synthesis engine is hidden from view. So, instead of scores of screens and menus providing access to all of its esoteric keymaps, algorithms, functions, layer effects, cascades, mixers and more, you have just a handful of parameters assigned to the sliders and switches on the top panel as well as to performance controllers such as the mod wheel and pedals. You can use these as live controls or to create new sounds to save in the user memories, as you wish. The parameters are assigned on a Program–by–Program basis, but there are standard maps to which most, if not all, conform. So, for example, synth sounds might have the filter cutoff frequency and resonance, the amplifier Attack, Decay and Release, detune, and the chorus, delay and reverb amounts assigned to the nine faders, whereas others might replace detune and chorus with, say, phaser or distortion amounts. Other controls are also sensibly assigned: for example, the modulation wheel defaults to the overdrive level when KB3 sounds are selected, and the Variation button (which generally does things like adding a pad behind a piano sound) then controls the Leslie fast/slow speed. If these choices aren’t to your taste, you can create your own assignments although, of course, only within the constraints of the parameters revealed via the editing system. You can also assign a MIDI CC to each control, which means that you can sequence any changes you make as you play. Elsewhere, you can determine things such as the pitch–bend range, level, and alternative tuning scales for each Program, as well as whether it’s polyphonic or monophonic, the latter with a legato mode and portamento. Programs also have access to multiple effects processors, with an Insert effects slot that can host one effects chain, and either one or two Auxiliary slots (applied in parallel either before or after the Insert effects) that can host two further chains. While it’s not possible to edit the chains using the Forte alone (for this, you’ll need the software editor) more than 1000 are provided, and they can affect your sounds subtly or radically as you choose, so it’s unlikely that none will meet your needs. Although a Kurzweil Program is equivalent to a patch on a conventional polysynth, Program mode also allows you to create a single keyboard split or to layer two sounds together. By default, pressing the Split button creates a split at MIDI Note B3 and inserts the ‘Finger Bass’ Program below this. Pressing the Layer button layers the current Program with ‘Add A Pad 2’. The Forte’s back panel.A Split is actually a special case of a two–zone Multi that allows you to adjust the choice of Programs, the split point, and the volume and pan of the two sounds. A Layer is a slightly different incarnation. But if you save either of these, you can later recall it as a full Multi, which allows you to add further zones and adjust a more detailed range of parameters. 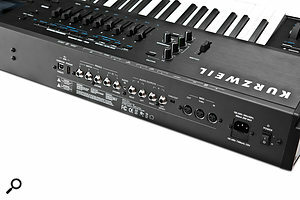 Depending upon the programming mode chosen (Basic or Advanced) this will then offer either four or up to 16 zones with parameters including the contained Program, its key range, its transposition, its volume, its mute status, its MIDI destination, its physical output, and various controller assignments. If you delve deeper, you can also access note-mapping options, velocity modes and curves, and maximum and minimum velocity levels that allow you to create velocity splits. Elsewhere, you can determine how the zones will respond to physical controllers and how they will send MIDI CCs to external equipment. Yet more parameters are common to all of the zones within the Multi — things such as the clock source and internal tempo (if used), and the zone in which any KB3 sound (if wanted) will be found. Unfortunately, the Forte and I fell out for a while when I first tried to program my own Multis. I need access to numerous splits and layers on my stage synths, so I took an existing Multi and scoured the top panel and menus to find the way to increase the number of zones. I switched from Basic mode to Advanced mode as instructed, and looked for the appropriate button or menu item. I couldn’t find one; it turns out that you have to press Favourite button 7 to do so. But whatever I attempted, the Forte refused to play ball, so I downloaded the latest OS and upgraded it. That worked, so I inserted my zone and then tried to switch on its Insert effects, but without success. I added up how many effects units I thought I was using, and it seemed to be well within the Forte’s limit, so I was at a loss to see what I was doing wrong. The engineers at Young Chang’s R&D Institute in the USA came to my rescue by explaining that, while you can invoke up to 11 Insert FX chains in a Multi, the boxes in the graphics describing those chains don’t necessarily represent one effect — a single box can include several effects units. This revealed why I was banging my head against the ceiling; the Forte can run out of effects units with complex Multis. Of course, very few synths are truly multitimbral with respect to effects, and Kurzweil could argue with some justification that, as the Forte is intended for use as a simpler form of VAST synthesizer, the manual wasn’t written for people whom they describe as ‘power users’. But had this been mentioned somewhere — anywhere! — I would have understood that the Forte was working correctly and not been tempted to launch it through a second–floor window. On numerous occasions while constructing my Multi, I silenced all but one zone and tried to adjust its Aux 1 send level only to find that all of the other zones returned to full volume unbidden and the Insert FX chain on the channel I was editing was disabled. Again, I tried to work out what I was doing wrong, but the problem remained until the chaps at Young Chang confirmed that I had discovered two bugs. To their credit, they sent an upgrade to me in a matter of hours, undertaking to send it out to their beta–testers the same evening and to release it to their users as soon as possible. (It worked, by the way.) I was impressed with the response but have to ask, how could such an obvious fault have survived previous testing? I don’t mean to be rude because I am sure that they’re very nice people, but Kurzweil’s beta–testers should hang their heads in shame. There was just one more element of the Forte left to test. At the end of the signal path, it offers two master effects derived from the PC3 series: a compressor followed by a three–band EQ with a sweepable mid–band. I found these to be worthwhile additions; a smidgen of compression often proved useful, and the EQ was handy when playing Programs live. Thanks to Kurzweil’s fast and helpful responses, the Forte was now working as it should, and I discovered that it has a great deal to commend it. At 22kg, it’s nicely manageable for a professional-quality 88–note instrument, and I like its uncluttered panel, which offers robust controls, clear on–screen menus, ‘live’ on–screen display of which parameter you’re adjusting when you grab a physical control, and many other welcome touches. OK, the start–up time is longer than I had expected given the use of Flash memory but, all in all, it looks and feels like a solid instrument for both stage and studio use. Talking about stage use, I’d like to correct something that you may have read elsewhere which states that the Forte truncates sounds when you select new Programs and Multis. That’s wrong. The sound will change if the effects chains in the previous and new selections are markedly different but, with the Change Multis and FX Mode parameters set appropriately, the underlying sounds can be sustained until you release them, and the transitions need not be abrupt or unpleasant, which can be very important when playing live. Of course, if you want to take the Forte beyond its Stage Piano tag, the SoundEditor software developed for the PC3 works well with it, instantly revealing the VAST synthesis engine that lurks within. If you want to view the Forte as an alternative to other ‘deep’ synthesizers, there’s probably none deeper. To my amazement, my time with the Forte suggests that neither Kurzweil’s testers, nor its customers, nor even other reviewers have tried using it beyond a superficial level. However, having been made aware of the problems I discovered, the company’s response was exemplary, so I hope that any remaining issues will be resolved before you read this. So where does that leave us? 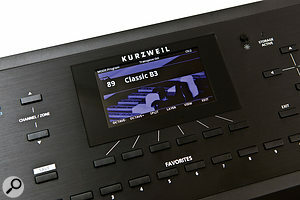 Kurzweil claim that “the Forte Stage Piano is the most advanced keyboard to ever bear the Kurzweil logo”. I suppose that, as others seem to have done, you could treat it as such (ie. as a stage piano) and restrict yourself to playing its factory sounds, but that would be a waste. There’s nothing stopping you from experimenting with its onboard editing or, like me, connecting it to a Mac or PC running SoundEditor, whereupon it becomes as powerful, frustrating, fascinating, impenetrable and rewarding as all the other Kurzweil synths based upon the VAST engine. You decide. There is an ever–increasing choice of instruments that you can describe as ‘stage pianos with organs and much more’. In addition, the acoustic pianos, e–pianos and organs in modern workstations can also be superb. For me, the leaders in the ‘pianos and more’ category are currently the Nord Stage 2 HA88 and its derivatives but, on paper, the Forte eats these for breakfast and spits out the crumbs; the size of its piano samples is huge in comparison, and the power and flexibility of the underlying VAST engine is, well, vast in comparison. What’s more, the multitimbral effects in the Forte put Clavia’s effects structure to shame. But there’s still something about the Nord Stage series that people love. 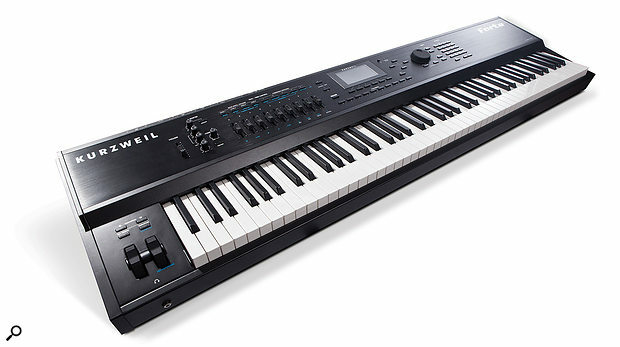 Elsewhere, there are interesting new piano/organ/synth models from Kawai, Roland and Yamaha. Alternatively, if you’re also planning on digging more deeply into the Forte’s synthesis, the competition lies elsewhere, probably in the realm of the Korg Kronos. Some workstations access larger waveform memories than the 16GB within the Forte, but they do so using disk drives. It’s therefore fair to say that Kurzweil’s Flash Play technology is a significant step forward, especially since it means that there’s no internal battery to go flat and dump your Programs and Multis. However, don’t be misled by the Audio input on the rear panel; despite the description of ‘16GB sample content’ the Forte has no sampling capabilities nor can it replay existing sample libraries. However, Young Chang are clear that the Forte is still being developed. One of the company’s Associate Directors wrote to me, “new and exciting features [are] coming in the next months. We consider Forte a very much alive platform and we will keep updating it, not only with bug fixes but also with cool new features. Some of them will actually be major.” I’m only speculating, but adding the ability to load new samples into the flash memory would be a major new feature indeed. I hope that this is planned. I understand that technological steps forward are always expensive when first unveiled but, at the time of writing, the list price of the Forte appears to be more than £1000$1000 higher than that of the Artis and, remarkably, £200$500 more than that of the PC3K8 and PC3A8. Adding the ability to change and extend its underlying soundset would go a long way to justifying the difference. On the far right of the Forte’s rear panel, you’ll find two USB sockets, one for computer/MIDI communications and the other for storage devices. Next, there’s a complement of five pedal inputs — three for switches, and two for continuous controllers. By default, the switches control sustain, sostenuto and ‘soft’, while the continuous pedals control volume and wah. However, you can reassign these functions on a per–sound basis should you wish. Interestingly, the Forte will analyse the polarity of connected pedals during power up so that you don’t obtain reversed operation. That’s a nice touch. The audio I/O comprises a 3.5mm TRS stereo audio input that allows you to play external audio through the Forte for accompaniment purposes, plus four balanced quarter–inch TRS audio outputs configured as two stereo pairs. (I was rather surprised to find that you can’t use these as four independent outputs.) Strangely, you’ll find the headphone socket on the rear panel of the Forte 7, but on the front of the 88–note model. The Forte also offers MIDI In/Out/Thru on five–pin DIN sockets, with a Thru/Out switch that allows you to use the Thru as a second Out, echoing the data sent from the dedicated Out. Finally, there’s an IEC mains input and an internal, universal 100–240 VAC, 50/60 Hz power supply. No cheap wall-wart here! 88–key, hammer–action with velocity and channel aftertouch. 128 voices plus KB3 Hammond voices. Fewer notes are available when sounds use multiple layers. 322 factory Programs plus 1024 user memories. 186 factory Multis plus 1024 user memories. 32 effects units organised as preset effects chains. Four x balanced quarter–inch (TRS or TS accepted) configured as two stereo pairs, plus headphones. In/Out/Thru on five–pin DIN, In/Out on USB. Internal 100–240 V AC, 50/60Hz PSU. It’s an attractive instrument; it looks and feels good. 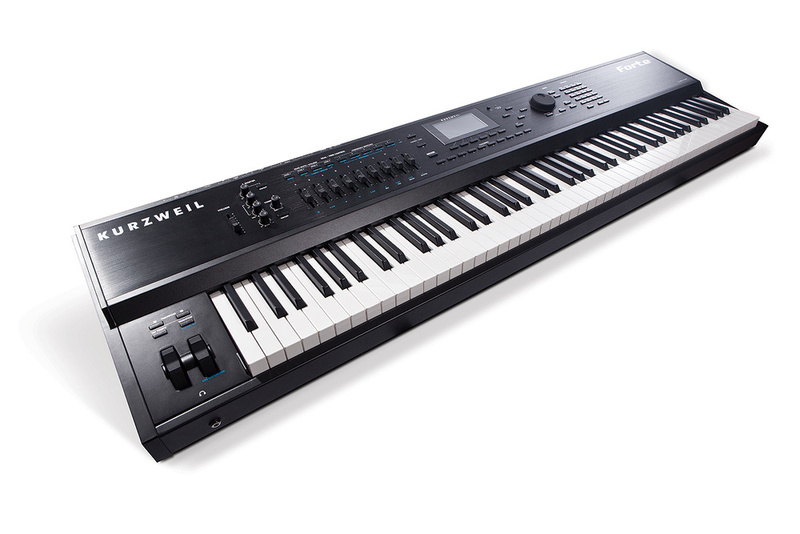 It offers the quality and warmth we’ve come to expect from a Kurzweil synth. Flash Play — essentially a pre–loaded SSD — points the way forward. With 16 splits/layers, it works well as a stage synth in demanding situations. Some of the piano Programs require further work. It exhibited bugs that should have been eliminated before it reached the market. The manual doesn’t fully explain the system, and needs to be expanded. The Forte conforms to a model that has become increasingly popular in recent years: a keyboard that you can use as a simple preset instrument, but which offers you the opportunity to delve much deeper if you have the inclination. It has had some teething problems but, when everything is fixed, it will be an impressive instrument.